Addition and subtraction (multiplication and even division is possible using special techniques). 210 x 340 x 150 mm (8.25" x 13.5" x 5.9"). Introduced at the end of 1970. Made in Germany by W. Feiler, G.m.b.h. for Imperial Typewriter Company, Leicester, England. This company was taken over by Litton Industries in the mid 1960s. 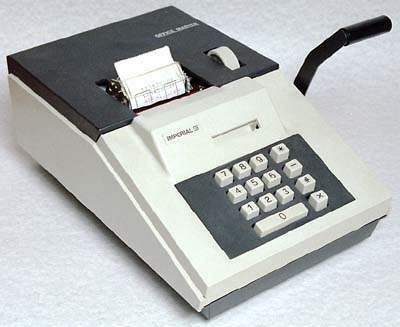 It sold calculators in the early 1970s, many of which are similar to Royal Typewriter and Triumph/Adler models, companies also owned by Litton. 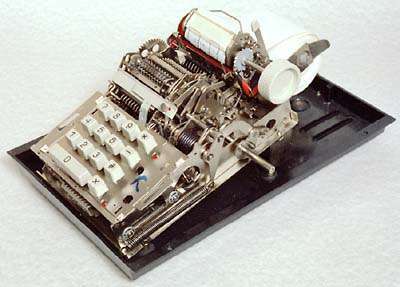 Click here for further information on Imperial models on the associated Vintage British calculators site. This manual mechanical adding machine was introduced to the market as late as the end of 1970. It was still much cheaper than the electronic calculators of the time and if you only wanted add-listing it would perform the job quite adequately.